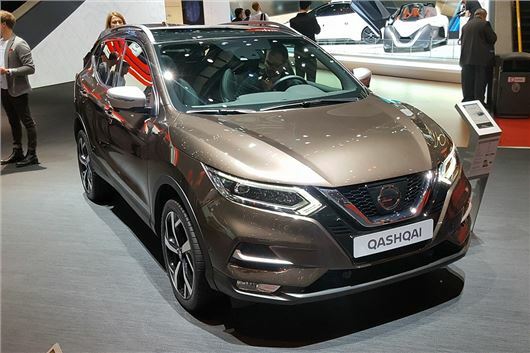 Nissan has sharpened up the Qashqai’s face, with a new angular grille and headlight design mirroring the new Micra. Revealed at the 2017 Geneva Motor Show, prices for the updated model will likely increase slightly, to start at around £19,000. The updated Qashqai has been refreshed inside too, with improved material quality and extra sound-proofing to enhance refinement. There’s also a new top trim level, called Tekna+, which includes leather upholstery with 3D quilting. A key new feature is the addition of ProPilot. This advanced safety technology controls steering, acceleration and braking on the motorway, providing semi-autonomous driving in all traffic conditions. Further new tech includes rear cross traffic alert and improved auto emergency braking. The engine range looks set to remain unchanged – so there’ll be 1.2-litre 115PS and 1.6-litre 163PS petrol engines, along with 1.5-litre 110PS and 1.6-litre dCi 130PS diesels. The range is predominantly front-wheel, but the top 130PS diesel gets all-wheel drive and an Xtronic automatic transmission.